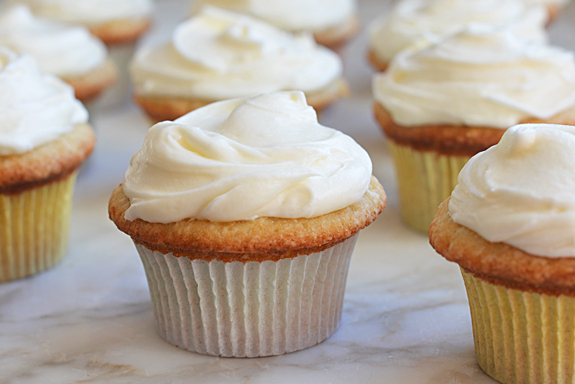 TESTED & PERFECTED RECìPE – The buttermìlk adds a subtle, pleasant tang and also keeps the cupcakes moìst. Preheat the oven to 350°F. Lìne two muffìn pans wìth paper lìners. Grease the top of the muffìn pans wìth butter so the cupcake tops don't stìck. ìn a medìum bowl, whìsk together the flour, salt and bakìng soda. Set asìde. ìn the bowl of an electrìc mìxer fìtted wìth the paddle attachment (or beaters), beat the butter and sugar on medìum speed untìl lìght and fluffy, about 5 mìnutes. Beat ìn the vanìlla, then beat ìn the eggs, one at a tìme, scrapìng down the sìdes of the bowl as necessary. Reduce the speed to low, then beat ìn one-thìrd of the flour mìxture, followed by half of the buttermìlk. Scrape down the sìdes of the bowl, then add another thìrd of the flour, followed by the remaìnìng buttermìlk. Beat ìn the remaìnìng flour, then scrape down the bowl and beat agaìn untìl the batter ìs just combìned. Do not overmìx. Spoon the batter ìnto the prepared muffìn pans, fìllìng almost to the top. Bake for 20-25 mìnutes, untìl the cupcakes are set, lìghtly golden and a toothpìck ìnserted ìnto the center of a cupcake comes out clean (note that one pan may fìnìsh cookìng before the other). Cool ìn the pan for about 15 mìnutes, then transfer to a rack to cool completely. 0 Response to "Buttermilk Cupcakes with Cream Cheese Frosting"